Moving a thousand miles away from home to your dream school is super exciting, but it can be a little daunting. Terrifying, actually. That's how I felt around this time last year - freshly accepted to American University, thrilled to start this new chapter of my life, but extremely nervous about how it would all work out. Then I came across the South Florida Summer Send Off event, a place to meet other incoming freshmen from my hometown before making the trek to D.C. I, like everyone else attending, had doubts on going to another "pre-freshmen" event where we would be expected to watch the same PowerPoint with the same "what to do" when you get to college lecture. I couldn't have been more off. 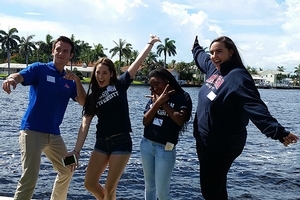 The Send Off in Miami, FL, was hosted by AU alumna, Amy Lampert, SOC/BA '94. She welcomed me and a few other soon-to-be freshmen into her house for an informal "hangout." It was the perfect place to ask any last-minute questions and meet a few people from our hometown, so we knew some familiar faces upon our arrival at our new home, American University. It was nice to connect with other first-year students and share the excitement and nerves of this new chapter of our lives. It made me much more at ease with starting in a brand-new place so far from home. I am incredibly grateful for the experience because it helped me in my transition to AU even more than I could have imagined. When I arrived at AU, I didn't feel like I was in a big sea of people where I didn't know where to start. I had the support and comfort of those I had met at the Summer Send Off to make the adjustment a bit easier. Upon arriving, we had each other to go to those first few weeks of welcome activities, trips to TDR, and exploring D.C. where we got to expand and meet other new people. I would recommend the Summer Send Off to all incoming students because it is so important to not feel alone during one of the biggest transitions of your lives. A semester in, I still love running into and hanging out with my Miami friends because it makes me feel like a piece of home is always with me! Thank you, Alumni Admissions Volunteers! You started my college experience at AU on the right track!